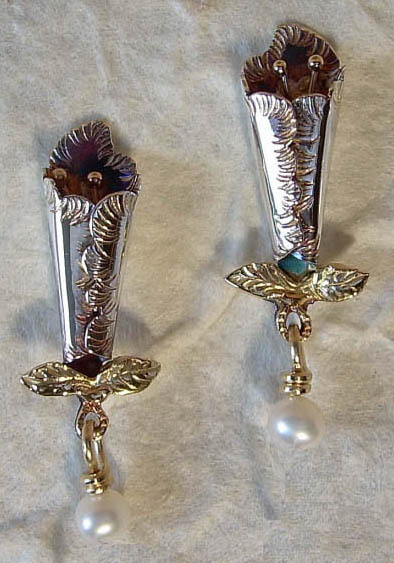 Sterling silver flowers are formed and textured from a silver sheet. 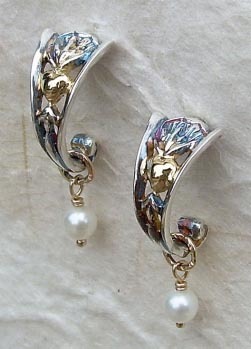 14k yellow gold stamen and 14k green gold leaves adorn the piece finished by freshwater pearl drops. 14k gold posts and medium friction backs. Measures 1.75" x .4". French ear wires are a available option size will be 2.0" x .4" e-mail. Elegant and versatile these hand carved and cast sterling silver hoop earrings can be worn for all occasions. 18k yellow gold hearts are decoratively soldered in the center. Freshwater pearl drops. 14k gold posts and medium friction backs. Measures 1.2" x .3". 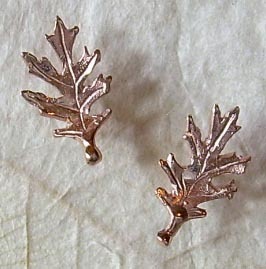 Northern Red Oak leaves are hand carved and cast in 14k rose gold. 14k posts with medium friction backs. Measures .7" x .4". Sterling silver flowers are formed and textured, 14k green gold leaves and 14k yellow stamens adorn the angels finished with freshwater pearls. 14k gold posts with medium friction backs. Measures 1.3" x .4". 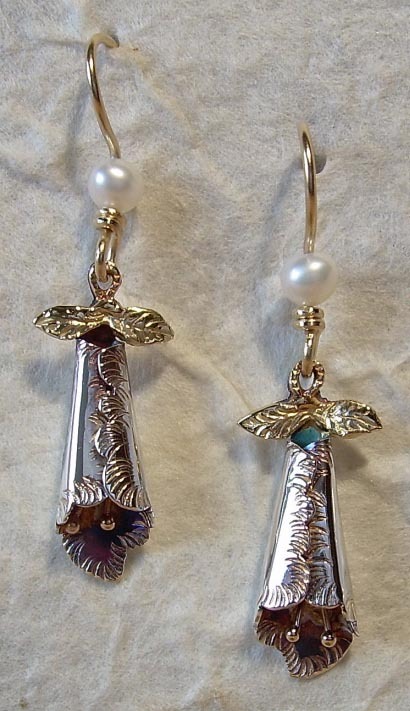 Sterling silver flowers are formed and textured, 14k green gold leaves and 14k yellow stamens adorn the angels finished with freshwater pearls. 14k yellow gold French ear wires. Measures 1.5" x .4". 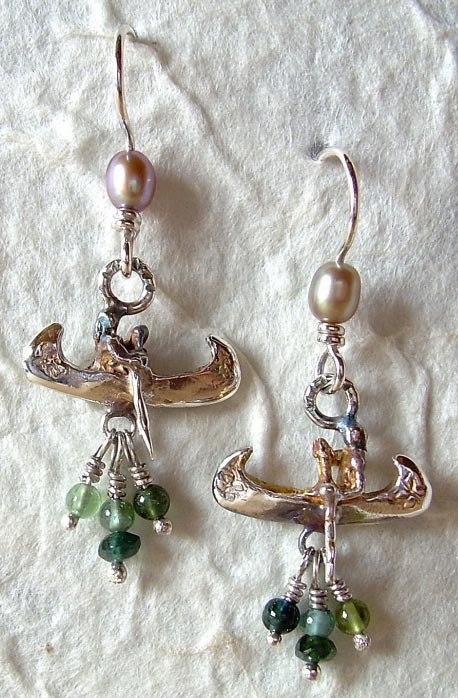 Hand carved and cast canoes with paddlers in sterling silver with drops of faceted round tourmaline beads. Sterling French ear wires with freshwater pearls. Measures 1.75" x .75". Matching necklace available. 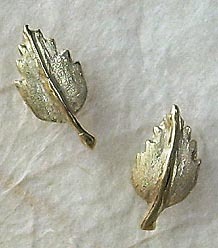 Paper birch leaf earrings are hand carved and cast in 14k green gold. Satin finish with high polish stems and 14k post with medium friction backs. Measures .5" x .3". 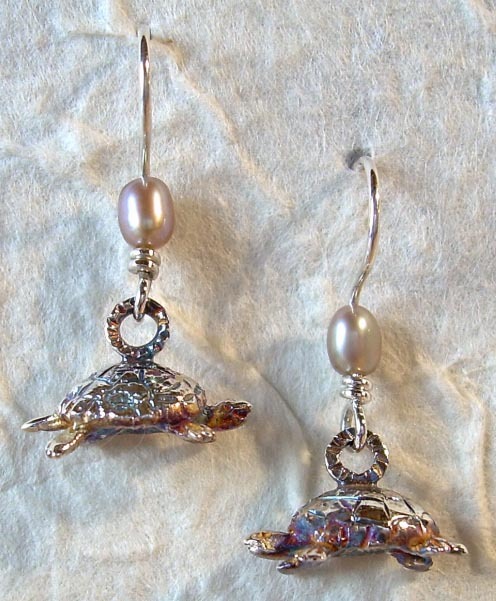 Sterling silver turtles are hand carved and cast. 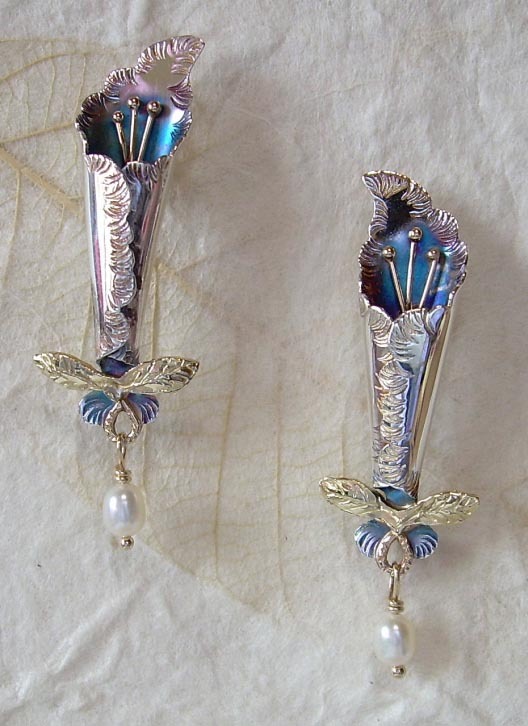 Sterling French ear wires are decorated with freshwater pearls. 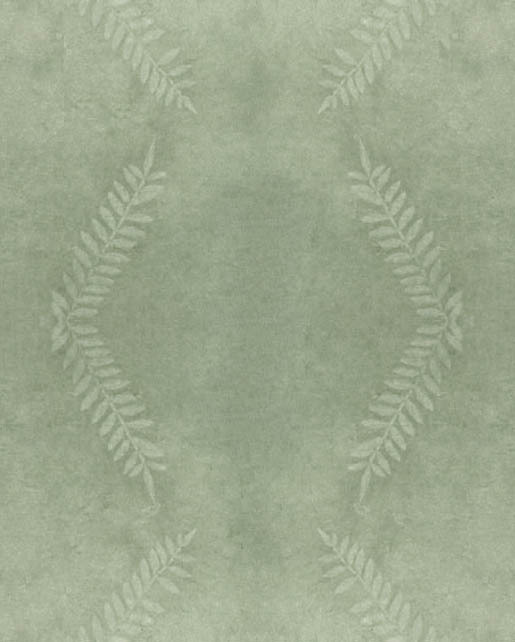 Measures 1.2" x .55". 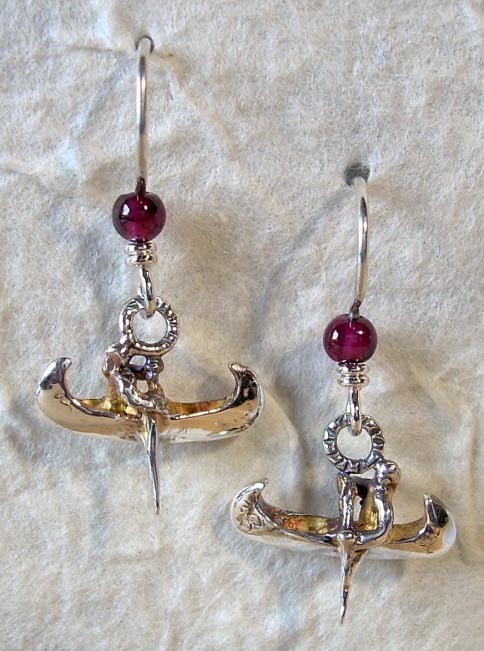 Hand carved and cast canoes with paddlers in sterling silver dangle from the sterling French ear wires with garnet beads. Measures 1.25" x .75".